Villa One recently refurbished in 2017 is located in a quiet and elevated position offering fabulous views across the Mediterranean Coastline and surrounding Taurus Mountains. 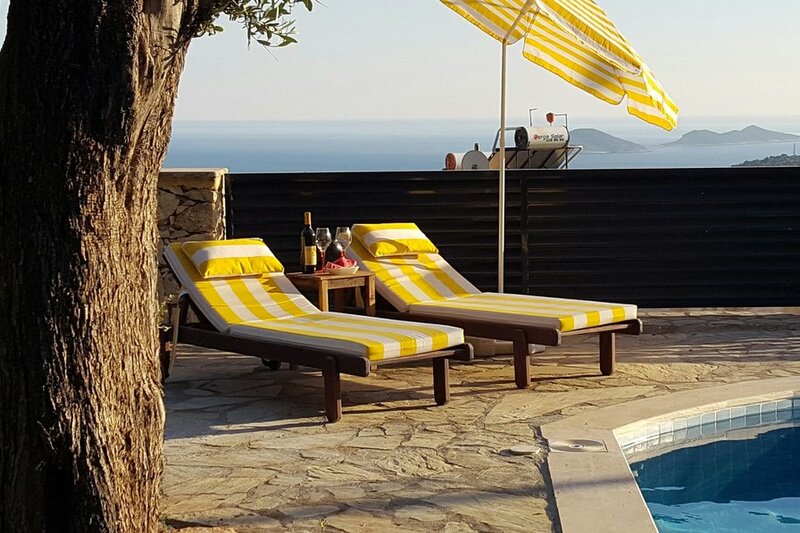 The villa is ideally situated within easy reach of the regions many historical sites and areas of natural beauty as well as Kalkan's wonderful array of quality restaurants, 15 minute walk or a few minutes drive or taxi ride away. The villa can accommodate up to 4 guests plus a baby cot and is stylishly furnished for your comfort and enjoyment (currently having a refit for 2017, new kitchen, beds and furnishings and upgrading of the outside space). The property in brief comprises of: Open plan dining and fully fitted kitchen with breakfast bar, lounge with satelite TV, DVD, furnished sun lounge with radio/bluetooth player and there is also a downstairs wc. On the 1st floor there are 2 double bedrooms with on-suite shower facilities and bidet style toilets, built in wardrobes, with separate access off each bedroom to the furnished balcony with views of the bay and islands. Upstairs there is a furnished covered and private Roof Terrace with bar area which has the most amazing views. Ideal for relaxing in the day or chilling out under the stars before bed. Outside is the Pool, Patio and Garden with outside seating area and 4 sunbeds with umbrellas, if required. If you have young children (baby) and require a cot, baby chair, car chair etc we can happily provide those for you at no extra charge. We live locally so we are always at hand to help you enjoy your time in beautiful Kalkan. Happy holidays. 2 outdoor dining areas (roof terrace or garden) Parking is directly outside the villa.